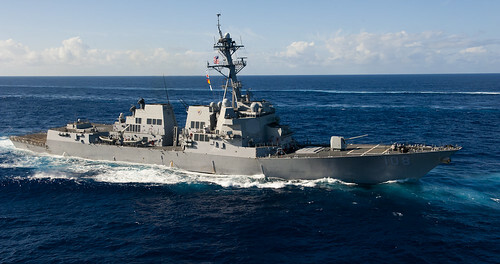 USS Wayne E. Meyer (DDG 108) file photo. SAN DIEGO - The Arleigh Burke-class guided-missile destroyer USS Wayne E. Meyer (DDG 108) is scheduled to depart Naval Base San Diego March 20 on an independent deployment to the Western Pacific Ocean. Wayne E. Meyer has a crew of nearly 300 officers and enlisted Sailors and is a multi-mission ship designed to operate independently or with an associated strike group. While deployed, the ship will conduct theater security cooperation and maritime presence operations with partner nations. "USS Wayne E. Meyer and her crew have spent the last year and a half preparing for this upcoming deployment and we are excited to be headed to the 7th Fleet area of responsibility," said Cmdr. Randy J. Van Rossum, Wayne E. Meyer's commanding officer. "We are ready to execute the missions required of us." Wayne E. Meyer is named after the late Rear Adm. Wayne E. Meyer, who is regarded as the "Father of Aegis," for his service as the AEGIS Weapons System Manager and later his development of the AEGIS Shipbuilding Project Office. This will be the ship's second deployment since it was commissioned Oct. 10, 2009, in Philadelphia. U.S. Third Fleet leads naval forces in the Eastern Pacific from the West Coast of North America to the international date line and provides the realistic, relevant training necessary for an effective global Navy.